We've always known this as Tacitus bellus but it appears the name Graptopetalum bellum is winning out. It's too bad; I really like the former name much better. No scientific reason...just like it! Tacitus is a monotypic genus, with bellus as it's only species. It differs from the other Graptopetalum by its large flowers that have lips around the carpels. O well, the lumpers appear to have won again! These have very large green leaves, not nearly as fuzzy as S. leuchotricha. They go dormant in the winter and come back strong in the Spring. The caudex can reach 30 cm. in diameter. Needs rich soil with good drainage, bright light when growing. They're native to Brazil. Another Lithops being added to our list is Lithops terricolor C134. Getting kind of crowded here, but they don't seem to mind. We've always liked Fred. Ever since we got our first one many years ago from Lazlo at Desert Nursery in Deming, New Mexico. The parent plant is totally lost in its fascinating monstrous growth. Our monthly meeting of the Oregon Cactus & Succulent Society was held last Thursday and the program was about the International Succulent Introductions (ISI), using their 50th anniversary CD with the digital projector. We also discussed plans for the upcoming events: Show and Sale at the Division Street Portland Nursery, June 18-20; Presentation by yours truly ("Growing Outstanding Succulent Plants") at the Stark Street Portland Nursery, 1 pm, July 11; Show and Sale at the Stark Street Portland Nursery, July 16-18. Sometimes I miss the simplicity of the old name; the new name becomes a bit of a mouth full. Quickly snapped this shot today as it's quite impressive. We keep this cactus - along with most of our cacti - very dry during the winter. As it tends to be a bit rot prone, it needs excellent drainage, but we don't give it anything different than we use with all our cacti as our potting mix has excellent porosity. It's been a while since I've posted any Lithops, so here goes. This is a new addition to our nursery plant list, Lithops hookeri ssp. marginata. The flowers are yellow. This is another one of those "old time" plants which keeps on keeping on. And no wonder with this fantastic flower. It's Lobivia 'Blaze'. Another one of our epicacti opened up the other day and, of course, it's one for which the label has been lost. And the plant itself looks like it's been to hell and back. It's one ugly plant, through no fault of its' own. But the flower...'nough said. Today was a busy day: meeting with our agricultural inspector in preparation for shipping plants to Germany (including a full greenhouse inspection); exploring a wonderful gift package from Ceci (thanks Ceci); and trying to get the Oregon C&S Society newsletter finished so I can get it in the mail for tomorrow. Plus, getting some orders out for some wholesale plants and seeds. These Johnson hybrids - Lobivia 'Pink & White' - have been a part of our lives since just after we got married. We bought a flat of them. And we've never regretted it. They don't have huge flowers, but the color is wonderful. This photo was taken in the greenhouse yesterday. There's a reason we chose this plant for our nursery logo. The flowers are totally dependable and absolutely fantastic...in my humble opinion. For example, this was today. One plant is producing all these flowers. I know, it's not considered a valid name anymore by some. It's been subsumed under Rebutia marsoneri. But I still call it by it's old name...and it comes! Echinocereus pectinatus - "Coahuila Lace Cactus"
This particular Echinocereus pectinatus is sometimes listed as "var. coahuila" but the variety status is very poorly supported. More likely it's one part of a continuum of variation which makes up this species. Whatever the name, the plant itself, sans flowers, presents a powerful yet graceful appearance. We hung some of Lynn-Marie's works on Friday. It's a small exhibit, but I think it looks quite nice. This was taken on Saturday as the first event of the Portland Rose Festival began with festivities in St. Johns, a neighborhood in North Portland. We're a small nursery and thus we get these statistical "flurries". Not a very scientific term but then statistics was never my cup of tea. What I mean is we could go a year without anyone wanting Agaves (a bit of an exaggeration) and then, all of a sudden, that's all anyone wants! Then, of course, when you run out of a particular plant, people wonder why you didn't stock more! The solution is that we grow the plants we like. That way, if nobody wants some particular plants we grow, we can at least enjoy them ourselves. We would like others to like what we like, of course, but we have no problem being the odd one out. This plant, Aloe 'White Stag', is a cultivar we've liked but wasn't drawing a crowd...for us at least. But now it's hard to keep them in stock. Oh well! even if nobody else has a clue about why you enjoy them! We just separated out these clumps of Rebutia albiflora which are just beginning to flower. In another week or two they'll be covered in flowers. Mix the two together and you get (or, more accurately, someone did get) Rebutia 'Sunrise' (R. heliosa x R. albiflora). We could see this one flowering, but all the plants were beyond reach. In other words, behind the larger growing opuntias, various larger spiny Euchporbia. But we did want to get a picture, so... And after moving things around a bit so that we could get close enough, Lynn-Marie shot this pic. Today it was the turn for Echinopsis 'Barber Pole' to bloom in unison. From the start let me affirm that we are not a nursery that raises jungle cacti for the market. But though our emphasis has always been on plants from more arid lands, we just can't resist a good Epi. This is Epicactus 'Madeline' and each year it catches us off guard. We don't even notice the buds, and then - wham - it's "in your face" beautiful! A couple of quick photos from C&J: the first of the hillside with the rows of cold-frames. The second a close-up of what I call the "wall of cactus" - - hey, another possible jigsaw puzzle. Just a note to say I might not get around to posting anything tomorrow, as it's our anniversary - our 41st - not that we're doing much. We may go out for a Chinese dinner - and try no to do any nursery business. We were going to go to the coast for a couple of nights, but the beach motel we go to didn't have two nights in a row available. One thing about this complex of plants: they're quite variable. 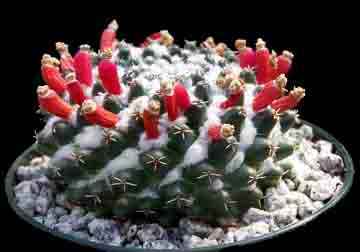 This is from a different group of Sulcorebutia (or Rebutia) canigueralii plants. Both the plant body and the flower are quite different than those I posted during the Winter last year. I'll be posting another variation in a day or two. This is the view from the parking area down to the growing areas at C and J wholesale cactus and succulent nursery. Unseen in this photo are about 6 more greenhouses on the left and about an acre of cold frames. In the distance you can almost see the Pacific Ocean. And this is Lynn-Marie looking over some of the plants in one of those greenhouses. We were lucky in that the weather was fairly cool when we were there this time.